Seasonal Pool and Tennis Court. Laid Back Lounge. Easy access to town, parks and back country. Kick back and relax after a fun filled day. Seasonal pool on site. Modern, well equipped kitchen. Plenty of prep space for the Master Chef. Counter seating - keep the cook company. Main level bedroom off of foyer. Main level bedroom with Queen bed. Large closet. Hall access bathroom on main level. Get your game on - tennis court on site. 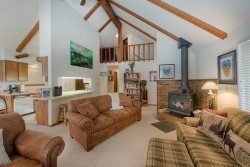 Spacious living space with wood burning stove. Upstairs master bedroom with small futon. Half wall loft with private door has two bunk sets. Hall access to upstairs bathroom. Upstairs bunk room. Well lit stairwell. Lounge around the pool. Tennis Court. Sports park is located across the road hosts the annual crafts fair. Entrance to the Aspens complex. McCall Municipal Golf Course and Clubhouse less than 1 mile away. Legacy Beach and Park less than 1 mile. McCall Marina - boat launch and marina is adjacent to Legacy Park and Beach. Kayak beautiful Payette Lake. Easy access to Winter Carnival festivities and downtown McCall. Our local gem, Ponderosa State Park just minutes from your front door. The north beach of Payette Lake has flat water kayak and canoe access. Bring your fishin` poles. Upper Payetter Lake is a fifteen minutes drive. Remodeled, two level condo in the well maintained ASPENS complex. Seasonal, outdoor pool and tennis courts. Less than 1 mile to the McCall Municipal Golf course and a short walk or bike ride to Davis Beach and Ponderosa State Park with beach and boat launch access. Less than ¾ mile from McCall Marina and Legacy Park and beach, downtown McCall shopping and dining. Convenient access to the annual Winter Carnival festivities. Cozy living room with wood burning stove and big screen TV. Petite patio access from living space to grassy common area. This property is just two doors down from the pool and just across from the tennis courts. Meals are hassle free in the well equipped, modern kitchen. Well crafted cabinetry, stone countertop, stainless appliances and creatively lit workspace with counter seating make “eating in” an experience for you and your guests. Don’t want to cook? Nearby downtown McCall offers a variety of dining venues and is less than one mile away. Inviting accommodations full size laundry for up to 8 people in three bedrooms and two bathrooms. Guest bedroom 1 is located on the ground floor and has a queen bed with hall access bathroom. Upstairs guest bedroom with queen bed and full size futon shares a hall access, full size bathroom with the guest “bunkroom” (two sets twin/twin) in the ½ wall loft with private door. The Laid Back Lounge condo is a great home base for easy recreation and entertainment access and laid back, year round fun. The City of McCall surrounded by Mountains with the natural gem, Payette Lake, at their base allows vacationers countless opportunities to discover and explore the outdoors. Lake and river fishing, boating, downhill and Nordic skiing, snowmobiling, hiking, biking or soaking at one of several hot springs in the area bring our guests back year after year all year long. Savor an alpine summer sunset from your balcony or deck or lakeside at Legacy Park. You are near downtown McCall. A great location for Winter Carnival. If you're a skating enthusiast - Hockey, public skating and McCall Starz on Ice! at the Manchester Ice & Event Centre smack dab in the middle of town. Shopping and dining are nearby.